*Red Raven: Red Raven is a human who was adopted by the Bird People and was raised as one of their own on an island in the sky that is above the Atlantic Ocean. When his people decide that they are going to invade Earth, Red Raven stops the attack by knocking them unconscious with sleeping gas and then freezing them in tubes that keep them alive, but unconscious. -Powers: Red Raven does not have any powers, but he has some advanced technology that he gained from the Bird People including artificial wings, a ray gun, and an anti-gravity gun. This issue takes place right where issue 43 left off with the X-Men unconscious and in the clutches of Magneto. 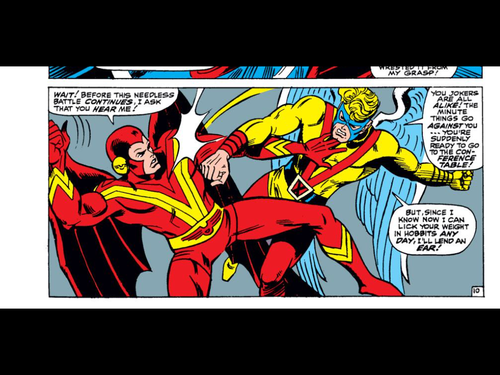 Magneto plans to kill the X-Men, but Quicksilver convinces them not to destroy them just yet. 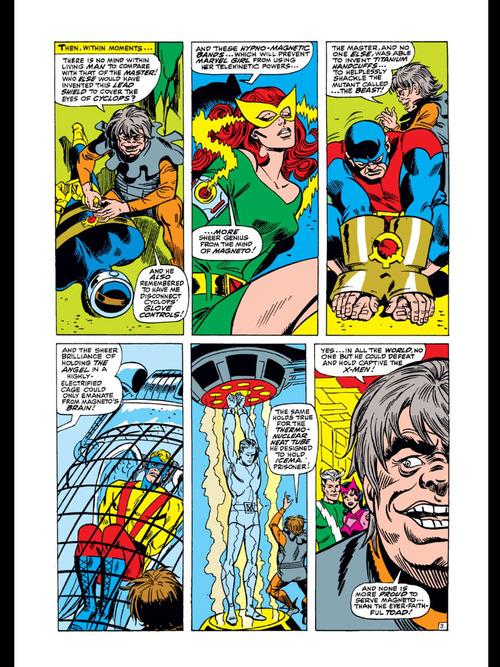 So instead, Magneto has Toad imprison the X-Men in specialized devices that Magneto created to contain the young mutants. 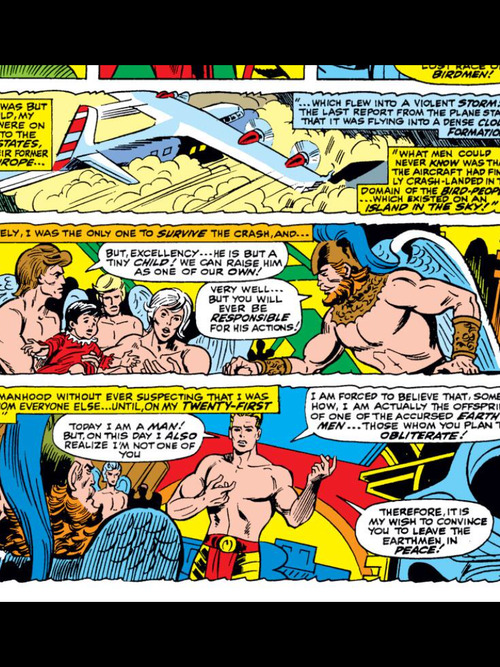 However, Angel finds a way to escape from his chains and Cyclops tells him to run off and convince the Avengers to come to their rescue. Angel starts to fly to New York, but gets tired during a storm and takes a rest on a rock in the middle of the ocean. Angel is startled when the rock grows and rises out of the ocean and Warren discovers that there is a secret base inside the rock. The young mutant enters the base and is confronted by Red Raven who attacks Angel at first site. 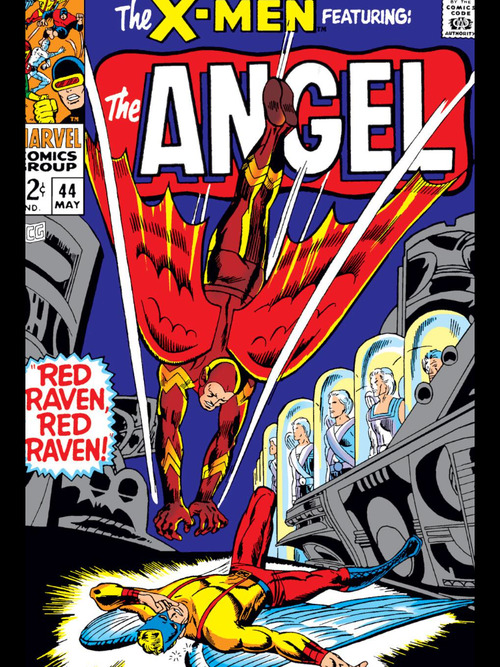 After a brief scuffle, Red Raven tells Angel the history of his people (Shown above in Red Raven’s bio briefly) and apologizes for attacking the mutant. The Rock base is a place where Red Raven keeps his people safe and as Angel leaves the rock, Red Raven has his headquarters sink back into the ocean. The issue then shifts to the origin story of Iceman. 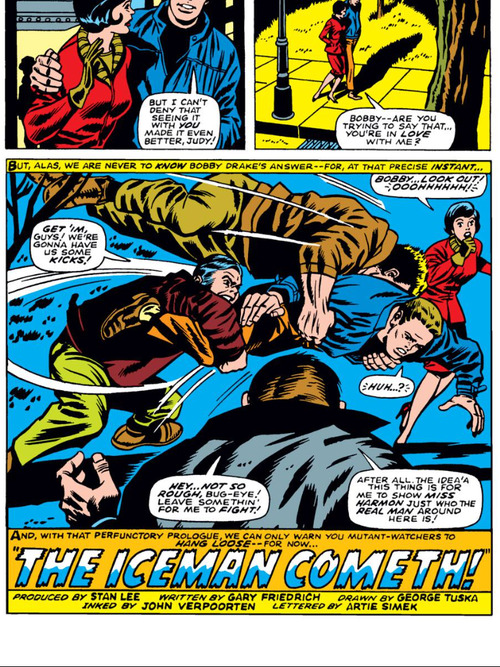 While on a date with his girlfriend, Iceman is attacked by a bunch of goons who are trying to steal his girl. To protect his girlfriend, Bobby attacks the bullies with his ice powers and his attackers flee in fear. 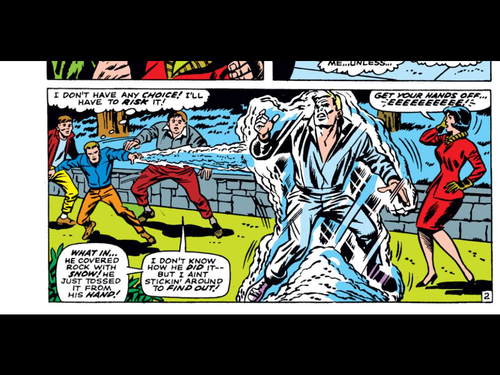 The attackers then tell their parents about Bobby’s powers and a mob appears outside of Iceman’s house. Iceman is brought to jail and the issue ends with Professor X and Cyclops deciding that they are going to come to Iceman’s aid. This issue had some major flaws, but it was still a solid issue. The biggest problem I had with this comic was Red Raven. He is an extremely boring villain with a ridiculous back-story. He did not realize he was not a Bird Man until he was 21 even though he doesn’t even have wings! Like Uncanny X-Men tends to do during multiple issue story arcs, this issue was a way to prolong the story arc. 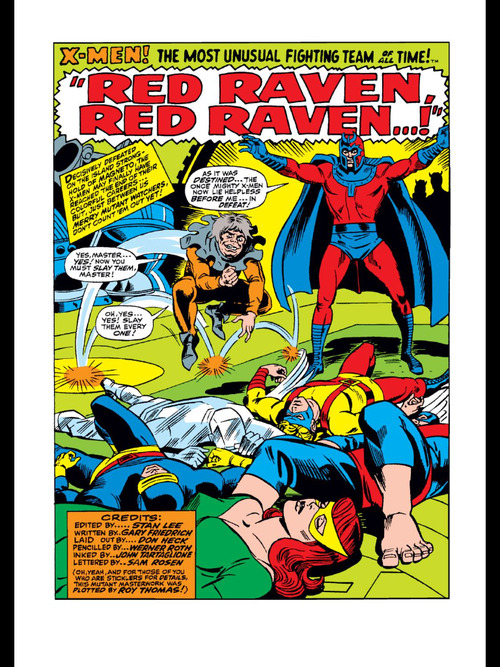 The Red Raven battle had nothing to do with Magneto and was pretty pointless. However, this issue still had some good points. 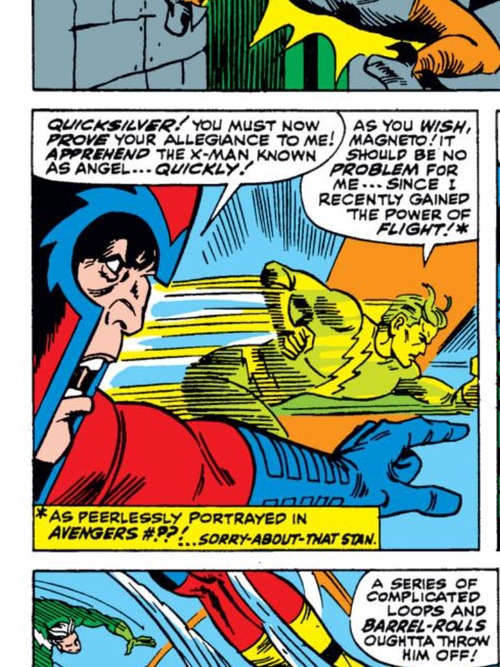 I continued to enjoy watching Quicksilver being conflicted. He saves the X-Men from death and I am pretty sure that he secretly had a hand in Angel’s escape. 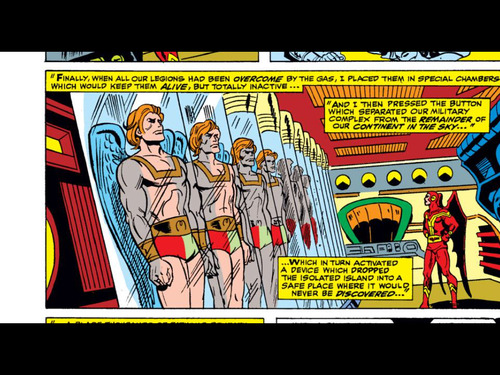 I also really enjoyed the beginning of Iceman’s origin story. Poor Bobby gets broken up with and thrown in jail just because he saved his girlfriend from some bullies. 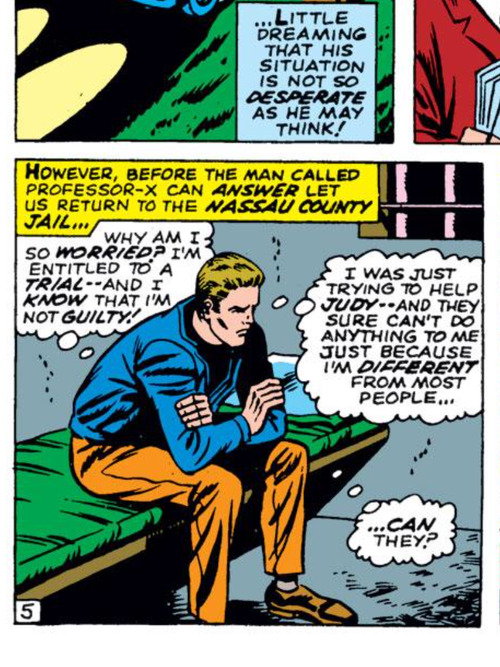 I can’t wait for Cyclops and Professor X to free Iceman from jail in the next issue. If this whole issue was about Red Raven it may have gotten only 1 star, but Magneto, Iceman and Quicksilver elevated this issue enough for me to give it 3 stars. 1. Cyclops calls Angel “Birdman” for the first time. I assume this is solely because Red Raven represents the Bird Men race and Gary Friedrich is failing at trying to be clever. 2. Apparently Quicksilver can fly now. I’m not sure Friedrich’s right about Pietro flying. Certainly if he could, he lost the knack later. A better writer would have played up Angel’s discovery of the Bird People as maybe the family and home he’s been looking for all his life. As an Asian-American, I know this feeling; America is not quite home, but certainly neither China nor Taiwan is either. Red Raven himself is the other case; not a true Bird Person, he only flies with high tech wings. “I can lick your weight in hobbits”, huh? 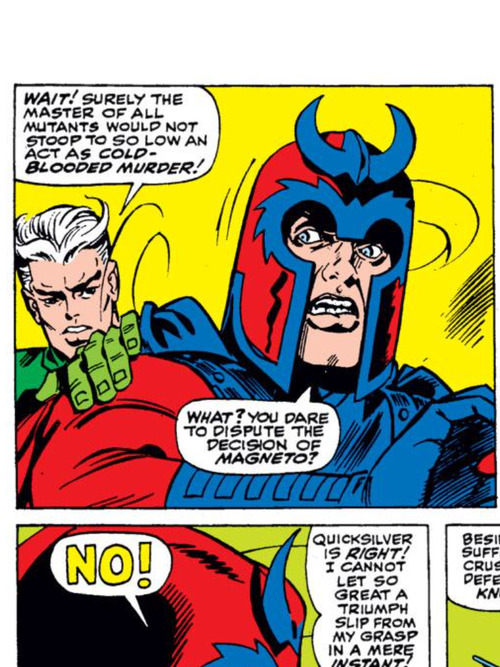 Magneto is generally a cut above the stereotypic villain, so it was pretty certain he would not actually kill the X-men. That does, however, fall into the standard villain list of mistakes: you know, not killing the hero(s), having a needlessly long explanation of his plan, killing in a needlessly long and complicated way, having easy-to-overpower minions, etc. Quicksilver is here doing what he and his sister usually do at this point; have good instincts although forced to be villains. But they don’t develop a huge following among fans and therefore they fall into the category also occupied by Hank Pym; heroes who go rogue for a bit later on. 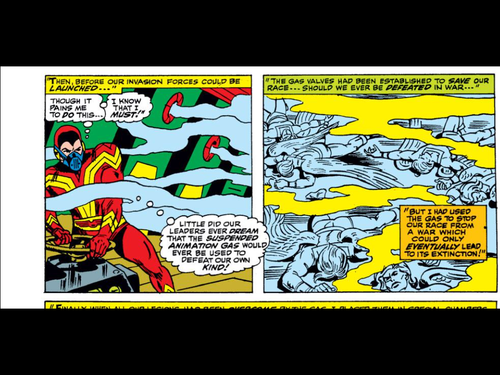 I suppose it was intentionally humorous how Toad boasts about Magneto’s genius. 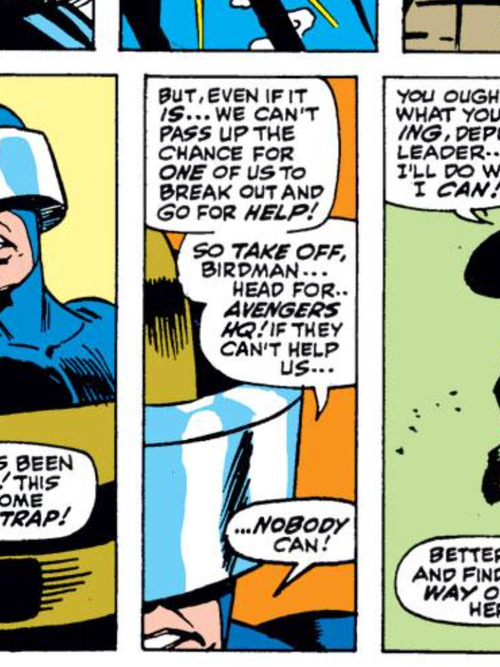 Actually, it’s a welcome relief from the main villain always boasting about his own genius; but as I said, Magneto’s supposed to be a cut above. As usual, the boast is misplaced, insofar as Angel does indeed get free. 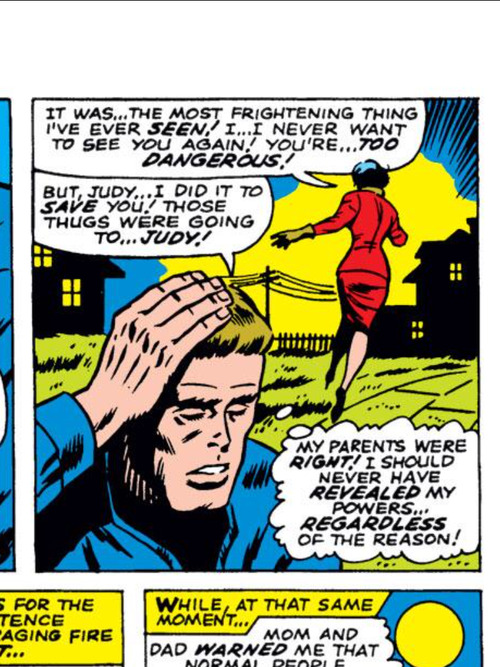 Well, if Judy was freaked out by Iceman’s powers, I guess she wasn’t the right girl, was she? Notice, by the way, that at the beginning of the date she asks him point-blank if he’s trying to say that he loves her? Pretty big leap from his words to that, in my humble opinion!